Endogenous retroviruses in the human genome can regulate genes involved in innate immune responses. Remnants of retroviruses that entered the human genome millions of years ago can regulate some innate immune responses. These viral sequences have previously been linked to controlling early mammalian development and formation of the placenta, among other things. A study published today (March 3) in Science establishes that one such endogenous retrovirus in human cells can also regulate the interferon response, which helps organisms quickly respond to infections. The work is one of the first reports to show that human cells could have adopted retroviral sequences to regulate their genes. Chuong and his University of Utah mentors Nels Eldeand Cédric Feschotte began by scanning the sequences around interferon-induced genes, finding at least 27 transposable elements that likely originated from the long repeats at the ends of retroviral sequences. One such element, known as MER41, comes from a virus that invaded the genome approximately 45 million to 60 million years ago; the team found that its sequence in present-day human cells contained interferon-inducible binding sites. The group then focused on a MER41 sequence that occurs 220 base pairs upstream of an interferon-induced gene called AIM2, which activates an inflammatory response in cells. When the researchers deleted this MER41 element in a cell line using CRISPR/Cas9 gene editing, interferon treatment could not trigger the AIM2 gene. Without the interferon-mediated response, these cells were more susceptible to viral infections, the team found. In addition to AIM2, the group found MER41 elements helped regulate at least three other interferon-inducible genes involved in human immunity. Looking across the genomes of other mammals, the researchers also found MER41-like regulatory elements in lemurs, bats, and other species. Whether host cells coopted the viral sequences for their regulatory needs or if ancient viruses used their regulatory abilities to control host immunity during invasion is still unknown, according to Feschotte. “We can only speculate why ancient viruses might have carried these regulatory switches to begin with, but data suggest they had these systems built into their sequence already,” he told The Scientist. Future studies are needed to establish that these regulatory mechanisms are functional in animals, said Macfarlan. In subsequent work, Feschotte and his colleagues aim to extend their studies to a mouse model and immune cell lines. To Feschotte’s mind, understanding how these sequences regulate human genes could shed light on previously unknown mechanisms of many diseases. While studies of cancer, autoimmune diseases, and other conditions have reported that endogenous retroviruses are reactivated in disease, the reasons for reactivation— and its consequences—are still unclear. “What has plagued this field is that we don’t the consequences or molecular mechanisms by which these endogenous retroviruses contribute to disease,” he said. E.B. Chuong et al., “Regulatory evolution of innate immunity through co-option of endogenous retroviruses,” Science, doi:10.1126/science.aad5497, 2016. Mammalian genomes contain many endogenous retroviruses (ERVs), which have a range of evolutionary ages. The propagation and maintenance of these genetic elements have been attributed to their ability to contribute to gene regulation. Chuong et al. demonstrate that some ERV families are enriched in regulatory elements, so that they act as independently evolved enhancers for immune genes in both humans and mice (see the Perspective by Lynch). The analysis revealed a primate-specific element that orchestrates the transcriptional response to interferons. Selection can therefore act on selfish genetic elements to generate novel gene networks. Endogenous retroviruses (ERVs) are abundant in mammalian genomes and contain sequences modulating transcription. The impact of ERV propagation on the evolution of gene regulation remains poorly understood. We found that ERVs have shaped the evolution of a transcriptional network underlying the interferon (IFN) response, a major branch of innate immunity, and that lineage-specific ERVs have dispersed numerous IFN-inducible enhancers independently in diverse mammalian genomes. CRISPR-Cas9 deletion of a subset of these ERV elements in the human genome impaired expression of adjacent IFN-induced genes and revealed their involvement in the regulation of essential immune functions, including activation of the AIM2 inflammasome. Although these regulatory sequences likely arose in ancient viruses, they now constitute a dynamic reservoir of IFN-inducible enhancers fueling genetic innovation in mammalian immune defenses. Viruses have been present for billions of years, affecting the gamut of life from single celled to multicellular organisms. But these diminutive infectious agents don’t leave behind fossils. Therefore, understanding their origin and evolution has proven difficult. However, researchers from Boston College have traced the spread of an ancient group of retroviruses—known as ERV-Fc—that affected 28 of 50 studied mammalian ancestors between 15 and 30 million years ago. Retroviruses affect various populations, and included in that group are immunodeficiency viruses, such as HIV-1 and HIV-2, and T-cell leukemia viruses. The ERV-Fc virus was traced to the beginning of the Oligocene Epoch, which was marked by the first appearance of elephants with trunks, early horses, and extensive grasslands, according to the Univ. of California Museum of Paleontology. In order to trace the virus group, the researchers searched mammalian genome sequence databases for ERV-Fc loci, and then “reconstructed the sequences of proteins representing the virus that colonized the ancestors of that particular species,” according to eLife. The researchers also followed the changing patterns in the ERV-Fc viruses’ genes as it adapted to various hosts. According to study co-author William E. Diehl, the research may help humanity predict the long-term effects of viral infections, and the future evolution of such organisms. Where is the most promising avenue to success in Pharmaceuticals with CRISPR-Cas9? There has been a rapid development of methods for genetic engineering that is based on an initial work on bacterial resistance to viral invasion. The engineering called RNA inhibition (RNAi) has gone through several stages leading to a more rapid and more specific application with minimal error. It is a different issue to consider this application with respect to bacterial, viral, fungal, or parasitic invasion than it would be for complex human metabolic conditions and human cancer. The difference is that humans and multi-organ species are well differentiated systems with organ specific genome translation to function. I would expect to see the use of genomic alteration as most promising in the near term for the enormous battle against antimicrobial, antifungal, and antiparasitic drug resistance. This could well be expected to be a long-term battle because of the invading organisms innate propensity to develop resistance. CRISPR/Cas (clustered regularly interspaced palindromic repeats/CRISPR-associated) systems are a bacterial defence against invading foreign nucleic acids derived from bacteriophages or exogenous plasmids1, 2, 3, 4. These systems use an array of small CRISPR RNAs (crRNAs) consisting of repetitive sequences flanking unique spacers to recognize their targets, and conserved Cas proteins to mediate target degradation5, 6, 7, 8. Recent studies have suggested that these systems may have broader functions in bacterial physiology, and it is unknown if they regulate expression of endogenous genes9, 10. Here we demonstrate that the Cas protein Cas9 of Francisella novicida uses a unique, small, CRISPR/Cas-associated RNA (scaRNA) to repress an endogenous transcript encoding a bacterial lipoprotein. As bacterial lipoproteins trigger a proinflammatory innate immune response aimed at combating pathogens11, 12, CRISPR/Cas-mediated repression of bacterial lipoprotein expression is critical for F. novicida to dampen this host response and promote virulence. Because Cas9 proteins are highly enriched in pathogenic and commensal bacteria, our work indicates that CRISPR/Cas-mediated gene regulation may broadly contribute to the regulation of endogenous bacterial genes, particularly during the interaction of such bacteria with eukaryotic hosts. In a paper published today in Cell researchers from the Broad Institute and University of Tokyo revealed the crystal structure of theStaphylococcus aureus Cas9 complex (SaCas9)—a highly efficient enzyme that overcomes one of the primary challenges to in vivo mammalian genome editing. First identified as a potential genome-editing tool by Broad Institute core member Feng Zhang and his colleagues (and published by Zhang lab in April 2015), SaCas9 is expected to expand scientists’ ability to edit genomes in vivo. This new structural study will help researchers refine and further engineer this promising tool to accelerate genomic research and bring the technology closer to use in the treatment of human genetic disease. “SaCas9 is the latest addition to our Cas9 toolbox, and the crystal shows us its blueprint,” said co-senior author Feng Zhang, who in addition to his Broad role, is also an investigator at the McGovern Institute for Brain Research, and an assistant professor at MIT. The engineered CRISPR-Cas9 system adapts a naturally-occurring system that bacteria use as a defense mechanism against viral infection. The Zhang lab first harnessed this system as an effective genome-editing tool in mammalian cells using the Cas9 enzymes from Streptococcus thermophilus (StCas9) andStreptococcus pyogenes (SpCas9). Now, Zhang and colleagues have detailed the molecular structure of SaCas9, providing scientists with a high-resolution map of this enzyme. By comparing the crystal structure of SaCas9 to the crystal structure of the more commonly-used SpCas9 (published by the Zhang lab in February 2014), the team was able to focus on aspects important to Cas9 function— potentially paving the way to further develop the experimental and therapeutic potential of the CRISPR-Cas9 system. RNAi and CRISPR-Cas9 have many clear similarities. Indeed, the mechanisms of both use small RNAs with an on-target specificity of ∼18–20 nt. Both methods have been extensively reviewed recently (3–5) so we only highlight their main features here. RNAi operates by piggybacking on the endogenous eukaryotic pathway for microRNA-based gene regulation (Figure 1A). microRNAs (miRNAs) are small, ∼22-nt-long molecules that cause cleavage, degradation and/or translational repression of RNAs with adequate complementarity to them(6).RNAi reagentsfor research aim to exploit the cleavage pathway using perfect complementarity to their targets to produce robust downregulation of only the intended target gene. The CRISPRCas9 system, on the other hand, originates from the bacterial CRISPR-Cas system, which provides adaptive immunity against invading genetic elements (7). Generally, CRISPR-Cas systems provide DNA-encoded (7), RNAmediated (8), DNA- (9) or RNA-targeting(10) sequencespecific targeting. Cas9 is the signature protein for Type II CRISPR-Cas systems (11). Both RNAi and CRISPR-Cas9 have experienced significant milestones in their technological development, as highlighted in Figure 2 (7–14,16–22,24–51) (highlighted topics have been detailed in recent reviews (2,4,52–58)). The CRISPR-Cas9 milestones to date have mimicked a compressed version of those for RNAi, underlining the practical benefit of leveraging similarities to this well-trodden research path. While RNAi has already influenced many advances in the CRISPR-Cas9 field, other applications of CRISPR-Cas9 have not yet been attained but will likely continue to be inspired by the corresponding advances in the RNAi field (Table 1). Of particular interest are the potential parallels in efficiency, specificity, screening and in vivo/therapeutic applications, which we discuss further below. Figure2. Timeline of milestones for RNAi and CRISPR-Cas9. Milestones in the RNAi field are noted above the line and milestones in the CRISPR-Cas9 field are noted below the line. These milestones have been covered in depth in recent reviews (2,4,52–29). This post contains a curation of all Early Diagnosis posts on this site as well as a curation of the Early Detection Research Network. Highlights of the accomplishments of the Early Detection Research Network. Hematopoietic stem cell transplantation from a healthy donor (allo-HSCT) represents the most potent form of cellular adoptive immunotherapy to treat leukemias. During the past decades, allo-HSCT has developed from being an experimental therapy offered to patients with end-stage leukemia into a wellestablished therapeutic option for patients affected by several hematological malignancies. In allo-HSCT, donor T cells are double edge-swords, highly potent against residual tumor cells, but potentially highly toxic, and responsible of the graft versus host disease (GVHD), a major clinical complication of transplantation. Gene transfer technologies can improve the safety (ie: use of suicide genes), and the efficacy (ie: TCR gene transfer, TCR gene editing, CAR gene transfer) of adoptive T-cell therapy in the context of allo-HSCT. The encouraging preclinical and clinical results obtained in these years with genetically engineered T lymphocytes in the treatment of leukemias will be discussed. Treatment of cancer has been one of the earliest and most frequent applications of gene therapy in experimental medicine. However, this indication entails unique difficulties, especially in the case of solid tumors. Pioneering strategies were aimed to reverse the malignant phenotype or to induce the death of cancer cells by transferring tumor-suppressor genes, inhibiting oncogenes or selectively expressing toxic genes. Proof of principle has been generated in abundant pre-clinical models and in humans. However, clinical efficacy is hampered by the diffi- culty in delivering therapeutic genes to a significant proportion of cancer cells in solid tumors using the currently available vectors. Therefore, current work aims to extend the effect to non-transduced cancer cells. This can be achieved by local or systemic expression of secreted proteins with the ability to block key pathways involved in angiogenesis, cell proliferation and invasion. Recent advances in gene therapy vectors allow sustained expression of transgenes and make these strategies feasible in the clinic. Another attractive option is the stimulation of immune reactions against cancer cells using gene transfer. In this case the therapeutic genes are antigens, cytokines or proteins capable of blocking the immunosuppressive microenvironment of tumors. Adaptation of replication-competent (oncolytic) viruses as vectors for these genes combines the intrinsic immunogenicity of viruses, their capacity to amplify gene expression and their direct lytic effect on cancer cells. In general, the ‘‘immunogene therapy’’ strategies offer the opportunity to destroy primary and distant lesions, especially if they are combined with other treatments that reduce tumor burden. More importantly, vaccination against cancer cells could prevent cancer relapse. Finally, gene and cell therapies are joining forces to improve the efficacy of adoptive cell therapy. Ex vivo gene transfer of natural or chimeric tumor-specific receptors in T lymphocytes enhances the cytotoxic potency of the cells and is expanding the applicability of this promising approach to different tumor types. Hematopoietic gene therapy is currently used to treat a variety of genetic disorders of the blood and immune systems, or metabolic diseases, with promising results. The approach currently relies on the infusion of patient-autologous hematopoietic stem cells that have been subjected to gene-transfer ex vivo with a viral vector of clinical grade, during a short period of culture. The manufacture of such advanced therapy medicinal products for clinical trials should comply with the clinical trials EC directive. Requirements for gene and cell-based medicinal products both apply, therefore a high level of complexity is involved in the development of such products. Hematopoietic cell and gene therapy has many potential indications based on encouraging preclinical and early-phase clinical results. However, somatic cell and gene therapy medicinal products are still in early phases of development and no such product has been registered yet. The standardization of the manufacturing process and characterization of the drug product (i.e. geneticallymodified cells) are important but present challenges. Many aspects, and in particular limited available patient material, complicate a precise characterization of the drug product. On the other hand, clinical-grade gene transfer retroviral vectors are well-characterized starting materials that are described in a pharmacopeia monograph and can be robustly manufactured in successive campaigns of production under GMP conditions. Examples obtained in preclinical and ongoing clinical studies to treat Wiskott Aldrich Syndrome illustrate the vast differences in the level of characterization between the viral vector starting material and the drug product used in hematopoietic gene therapy. Characterization of the products and standardization/ validation of the manufacturing process are the next challenges in the field. Gene therapy of inherited diseases has provided convincing evidence of therapeutic benefits for many treated patients. In particular, treatment of primary severe congenital immunodeficiencies by gene transfer into hematopoietic stem cells (HSCs) has proven in some cases to be as beneficial as allogeneic stem cell transplantation, the treatment of choice for these diseases if HLA-matched donors are available. We conducted a Phase I clinical trial aimed at the correction of X-CGD, a rare inherited immunodeficiency characterized by severe and life threatening bacterial and fungal infections as well as widespread tissue granuloma formation. Phagocytic cells of CGD patients fail to kill ingested microbes due to a defect in the nicotinamide dinucleotide phosphate (NADPH) oxidase complex resulting in compromised antimicrobial activity. In this clinical trial we used a gammaretroviral vector with strong enhancer-promoter sequences in the long terminal repeats (LTRs) to genetically modify CD34 + cells in two X-CGD patients. After successful reconstitution of phagocytic functions, both patients experienced a clonal outgrowth of gene marked cells caused by vector-mediated insertional activation of proto-oncogenes leading to the development of myeloid malignancies. Moreover, functional correction of gene transduced cells decreased with time, due to epigenetic inactivation of the vector promoter within the LTR, resulting in the accumulation of nonfunctional gene transduced cells. The understanding of the molecular basis of insertional mutagenesis has motivated the development of advanced integrating vectors with equal therapeutic potency but reduced genotoxicity. In particular, the deletion of the enhancer elements within the viral LTR U3 regions has significantly contributed to the reduction of genotoxic effects associated with LTR-driven gammaretroviral vectors. Moreover, the use of tissue specific promoters, which are inactive in stem/progenitor cells but active in terminally differentiated cells, should further increase the safety level of SIN vectors. Based on the aforementioned advancements, we developed SIN gammaretroviral and lentiviral vectors for the safe and effective gene therapy of X-linked CGD. We combined the SIN configuration with an internal promoter, with preferential expression in myeloid cells. However, the introduction of a new vector into the clinic demands a series of sophisticated pre-clinical studies, which are quite challenging in particular within an academic environment. In this presentation we will report on the comprehensive and thorough preclinical efficacy and safety testing of both SIN vectors assessing dosage requirements, therapeutic efficacy, resistance to transgene silencing and genotoxic potential. In vivo gene replacement for the treatment of an inherited disease is one of the most compelling concepts in modern medicine. Adeno-associated virus (AAV) vectors have been extensively used for this purpose and have shown therapeutic efficacy in a range of animal models. The translation of preclinical results to the clinic was initially slow, but early studies in humans helped defining the roadblocks to successful therapeutic gene transfer in vivo, which are highly depending on the target tissue, the route of vector delivery, and the specific disease. The development of strategies to overcome these limitations allowed achieving long-term expression of donated genes at therapeutic levels in patients with inherited retinal disorders, hemophilia B and other diseases. The recent market approval of Glybera, an AAV vector-based gene therapy product for lipoprotein lipase deficiency, further con- firmed the potential of AAV vectors as a therapeutic platform, raising hopes for the development of in vivo gene transfer treatments for many additional inherited and acquired diseases. Glybera, is a gene therapy product based on the use of recombinant adeno-associated virus for gene delivery. It is designed for patients with Lipoprotein Lipase Deficiency (LPLD). On November 2, 2012, the European Commission approved the marketing authorisation for Glybera as a treatment for LPLD, under exceptional circumstances, in all 27 EU member states. Glybera is intended to treat patients with lipoprotein lipase deficiency. LPLD is caused by errors in the gene that codes for the protein lipoprotein lipase (LPL). LPL has a central role in fat metabolism. Non-functional LPL can lead to pancreatitis attacks, the most sever phenotype of this disease. The presentation will cover a summary of the clinical development, as well as a summary of the regulatory process. In addition post approval commitments will be discussed and their importance to follow up on the long term safety and efficacy of the this gene therapy product. The pluripotent and multipotent states of stem cells are governed by the expression of few, specific transcription factors forming a highly interconnected regulatory network with more numerous, widely expressed transcription factors. When the set of master transcription factors comprising Oct4, Sox2, Klf4, and Myc is expressed ectopically in somatic cells, this network organizes itself to support a pluripotent cell state. But when Oct4 is replaced by Brn4, another POU transcription factor, fibroblasts are converted into multipotent neural stem cells. These two transcription factors appear to play distinct but interdependent roles in remodelling gene expression by influencing the local chromatin status during reprogramming. Furthermore, structural analysis of Oct4 bound to DNA shows that the Oct4 linker—a region connecting the two POU domains of Oct4—is exposed to the surface, and we therefore postulate that it recruits key epigenetic players onto Oct4 target genes during reprogramming. The role of Oct4 in defining totipotency and inducing pluripotency during embryonic development remains unclear, however. We genetically eliminated maternal Oct4 using a Cre/ lox approach and found no effect on the establishment of totipotency, as shown by the generation of live pups. After complete inactivation of both maternal and zygotic Oct4 expression, the embryos still formed Oct4-GFP– and Nanog–expressing inner cell masses, albeit nonpluripotent, indicating that Oct4 is not a determinant for the pluripotent cell lineage separation. Interestingly, Oct4-deficient oocytes were able to reprogram fibroblasts into pluripotent cells. Our results indicate that, in contrast to its crucial role in the maintenance of pluripotency, maternal Oct4 is crucial for neither the establishment of totipotency in embryos, nor the induction of pluripotency in somatic cells using oocytes. Reprogramming into induced pluripotent stem cells (iPSCs) has opened new therapeutic opportunities, however, little is known about the possibility of in vivo reprogramming within tissues. We have generated transgenic mice with inducible expression of the four Yamanaka factors. Interestingly, transitory induction of the reprogramming factors results in teratomas emerging from multiple organs, thereby, implying that full reprogramming can occur in vivo. Analyses of the stomach, intestine, pancreas and kidney reveal groups of dedifferentiated cells that express the pluripotency marker NANOG, indicative of in situ reprogramming. Also, by bone marrow transplantation, we demonstrate that hematopoietic cells can also be reprogrammed in vivo. Remarkably, induced reprogrammable mice also present circulating iPSCs in the blood. These in vivo-generated iPSCs can be purified and grown (in the absence of further induction of the reprogramming factors). Strikingly, at the transcriptome level, the in vivo-generated iPSCs are closer to embryonic stem cells (ESCs) than to standard in vitro-generated iPSCs. Moreover, in vivo-iPSCs efficiently contribute to the trophectoderm lineage, suggesting that they achieve a more plastic or primitive state than ESCs. Finally, in vivo-iPSCs show an unprecedented capacity to form embryo-like structures upon intraperitoneal injection, including the three germ layers of the proper embryo and extraembryonic tissues, such as extraembryonic ectoderm and yolk sac-like with associated embryonic erythropoiesis. These capacities are absent in ESCs or in standard in vitro-iPSCs. In summary, in vivo-iPSCs represent a more primitive or plastic state than ESCs or in vitro-iPSCs. These discoveries could be relevant for future applications of reprogramming in regenerative medicine. The development of gene-editing technologies in combination with the generation of patient-specific induced pluripotent stem cells (iPSCs) represents the merge of both the stem cell and gene therapy fields. Novel gene-editing technologies in combination with iPSCs derivation methodologies open the possibility not only for direct gene therapy but also for the replenishment of loss and/or defective cell populations with gene-corrected cells. We will present recent examples developed in our laboratory to illustrate some of the different approaches being undertaken in these fields. Non-viral gene transfer approaches typically result in only short-lived transgene expression in primary cells, due to the lack of nuclear maintenance of the vector over time and cell division. The development of efficient and safe non-viral vectors armed with an integrating feature would thus greatly facilitate clinical gene therapy studies. The latest generation transposon technology based on the Sleeping Beauty (SB) transposon may potentially overcome some of these limitations. SB was recently shown to provide efficient stable gene transfer and sustained transgene expression in primary cell types, including human hematopoietic progenitors, mesenchymal stem cells, muscle stem/progenitor cells (myoblasts), iPSCs and T cells. The first-in-man clinical trial has been launched to use redirected T cells engineered with SB for gene therapy of B cell lymphoma. In addition, an EU FP7 project was recently initiated with the aim of replacing degenerated retinal pigment epithelial cells with cells that have been genetically modified by SB gene vectors ex vivo to produce an anti-angiogenic and neuroprotective factor for the potential treatment of patients suffering from age-related macular degeneration. To determine novel key regulators that direct ES/iPS cell differentiation to hematopoietic lineages, we compared the gene expression profiles of multiple iPS cell lines with differential blood forming capacity. We generated multiple iPS cell lines from amniotic fluid derived mesenchymal stromal cells (AFiPS) which differentiated towards hematopoietic lineages using our standardized and highly reproducible differentiation protocol. Of the 9 AF-iPS cell lines derived from an individual female patient, the average efficiency of CD45 + hematopoietic cells was 14.2 + / – 9% (range 1.6 to 26.3%). To elucidate the possible reasons for this diversity in efficiency, we grouped the AF-iPS cell lines on the basis of lowest and highest blood differentiation capacity and compared their gene expression pro- files by microarray. We found very few changes above 1.5-fold, but interestingly, among the 11 genes that were over-expressed in the AF-iPSC lines with poor blood differentiation efficiency, 10 were located on X chromosome, and the remaining one reported to be involved in Notch signalling. A combination of cumulative sum analysis and the location of differentially expressed genes on the X chromosome identified putative regions of reactivation at multiple, but distinct locations. The possibility of X-reactivation in these female lines was reinforced further where lower levels of XIST were seen in AF-iPSC lines shown to have low blood forming potential, however only half of the iPS cell lines with high blood differentiation capacity showed normal XIST expression when compared to the amniotic fluid mesenchymal starting cell material. To determine whether the block in differentiation was tissue specific we tested the differentiation capacity of the AF-iPSC lines towards neuronal lineages. Intriguingly, we found neural cell differentiation was not hampered within all lines with poor blood potential suggesting that the over-expression of genes as a consequence of X-reactivation can impart a specific negative effect on differentiation towards the blood lineages from pluripotency stage, while not having an effect on neuronal cell development. To further define the source of this block, we have begun working knocking down the overexpressed genes on X chromosome in lines with poor blood differentiation potential to determine whether the efficiency can be increased (or fully rescued) with one, or a combination of these 11 candidate genes. These results have implications for the identification and selection of female iPS lines suitable for therapeutic purposes. I will also discuss the identification of three new factors for improving blood lineage potential of iPS cells lines. Notch signaling is essential for definitive embryonic hematopoiesis, but little is known on how Notch regulates hematopoiesis in early human embryonic development. Here we analyzed the contribution of Notch signaling to human embryonic hematopoietic differentiation using hESCs. We determined the expression of Notch receptors and ligands during hematopoietic differentiation of hESCs and found that expression of the Notch ligand DLL4 strongly parallels the emergence of bipotent hematoendothelial progenitors (HEPs). Co-cultures of hESCs with OP9-DLL4 cells demonstrated that DLL4 has a dual role in hematopoietic differentiation: during HEPs specification untimely DLL4-mediated Notch activation is detrimental for HEPs generation; however, once HEPs are specified, activation of Notch by DLL4 enhances hematopoietic commitment of these HEPs. We determined by flow cytometry that in hESCs differentiation, DLL4 is only expressed in a subpopulation of HEPs. Gene expression profiling of DLL4high and DLL4low/- HEPs showed that these two subpopulations already exhibit a distinct transcriptome program which determines their differentiation commitment: DLL4high HEPs are highly enriched in endothelial genes, while DLL4low/- HEPs display a clear hematopoietic transcriptional signature. Single cell cloning analysis of these two populations confirmed that DLL4high HEPs are enriched in committed endothelial precursors, while DLL4low/- HEPs contain committed hematopoietic progenitors. Confocal microscopy analysis of whole embryoid bodies revealed that DLL4high HEPs are located in close proximity to DLL4low/- HEPs, and at the base of clusters of CD45 + cells forming structures that resemble AGM hematopoietic clusters found in mouse embryos. Moreover, we found active Notch1 in clusters of emerging CD45 + cells. Overall, our data indicate that DLL4 regulates blood formation from hESCs, with DLL4high HEPs enriched in endothelial potential, whereas DLL4low/- HEPs are transcriptional and functionally committed to hematopoietic development. We propose a model for human embryonic hematopoiesis in which DLL4low/- HEPs receive a signal from DLL4high HEPs to activate Notch1, to undergo an endothelial-to-hematopoietic transition and differentiate into CD45 + hematopoietic cells, resembling what occurs in mouse AGM hematopoietic clusters. “If we can stop CDK8 from inactivating STAT1 in NK cells, we could stimulate tumor surveillance and thus possibly have a new handle on treating cancer, harnessing the body’s own weapons against malignant cells.” –Dr. Eva Maria Putz. Mammals contain cells whose primary function is to kill other cells in the body. The so-called Natural Killer (NK) cells are highly important in defending our bodies against viruses or even cancer. Scientists at the University of Veterinary Medicine, Vienna (Vetmeduni Vienna) provide evidence that NK cell activity can be influenced by phosphorylating a protein (STAT1) in NK cells. The results, which could be of immediate therapeutic relevance, were recently published. Since its discovery in the early 1990s, the protein STAT1 (Signal Transducer and Activator of Transcription 1) has been found to be central in passing signals across immune cells, ensuring that our bodies react quickly and appropriately to threats from viruses or other pathogens. Animals without STAT1 are also prone to develop cancer, suggesting that STAT1 is somehow involved in protection against malignant cells. The STAT1 protein is known to be phosphorylated on at least two positions: phosphorylation of a particular tyrosine (tyr-701) is required for the protein to enter the cell nucleus (where it exerts its effects), while subsequent phosphorylation of a serine residue alters the way it interacts with other proteins, thereby affecting its function. Natural Killer (NK) cells are among the first cells to respond to infections by viruses or to attack malignant cells when tumors develop. When they detect cells to be targeted, they produce a number of proteins, such as granzyme B and perforin, which enter infected cells and destroy them from within. Clearly, the lethal activity must be tightly controlled to prevent NK cells from running wild and destroying healthy cells or tissues. How is this done? Eva Maria Putz and colleagues at the Institute of Pharmacology and Toxicology of the University of Veterinary Medicine, Vienna (Vetmeduni) have now investigated the importance of STAT1 phosphorylation in NK cells. The researchers found that when a particular serine residue (ser-727) in the STAT1 protein is mutated, NK cells produce far higher amounts of granzyme B and perforin and are far more effective at killing a wide range of tumor cells. Mice with the correspondingly mutated Stat1 gene are far less likely to develop melanoma, leukemia, or metastasizing breast cancer. On the other hand, when the same serine residue is phosphorylated, the NK cells are less able to kill infected or cancerous cells. Illustration: Inhibition of NK cells by phosphorylation of STAT1-Serin 727 mediated by CDK8. –Eva-Maria Putz/Vetmeduni Vienna. The new cells successfully regenerated axons and extended their growth farther across nerve cell gaps toward damaged nerve stumps, with healthier vascularity. A study carried out by researchers at the Kyoto University School of Medicine has shown that when transplanted bone marrow cells (BMCs) containing adult stem cells are protected by a 15mm silicon tube and nourished with bio-engineered materials, they successfully help regenerate damaged nerves. The research may provide an important step in developing artificial nerves. 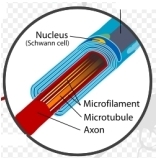 Nourished with bioengineered additives, such as growth factors and cell adhesion molecules, the BMCs after 24 weeks differentiated into cells with characteristics of Schwann cells – a variety of neural cell that provides the insulating myelin around the axons of peripheral nerve cells. The new cells successfully regenerated axons and extended their growth farther across nerve cell gaps toward damaged nerve stumps, with healthier vascularity. Grafting self-donated (autologous) nerve cells to damaged nerves has been widely practiced and considered the “gold standard.” However, autologous cells for transplant are in limited supply. Allologous cells, donated by other individuals, require the host to take heavy immunosuppressant drugs. Down’s syndrome is a common disorder with enormous medical and social costs, caused by trisomy for chromosome 21. We tested the concept that gene imbalance across an extra chromosome can be de facto corrected by manipulating a single gene, XIST (the X-inactivation gene). Using genome editing with zinc finger nucleases, we inserted a large, inducible XIST transgene into the DYRK1A locus on chromosome 21, in Down’s syndrome pluripotent stem cells. The XIST non-coding RNA coats chromosome 21 and triggers stable heterochromatin modifications, chromosome-wide transcriptional silencing and DNA methylation to form a ‘chromosome 21 Barr body’. This provides a model to study human chromosome inactivation and creates a system to investigate genomic expression changes and cellular pathologies of trisomy 21, free from genetic and epigenetic noise. Notably, deficits in proliferation and neural rosette formation are rapidly reversed upon silencing one chromosome 21. Successful trisomy silencing in vitro also surmounts the major first step towards potential development of ‘chromosome therapy’. A new article published in Regenerative Medicine reviews the latest advances in magnetic particle tracking in cell therapy, a potentially groundbreaking strategy in disease treatment and regenerative medicine. Cell therapy is one of the most promising avenues for regenerative medicine, however, its success is restricted by a number of limitations, such as inefficient delivery and retention of the therapeutic cells at the target organ, difficulties in monitoring the safety and efficacy of the therapy, in addition to issues obtaining and maintaining therapeutic cell phenotypes. In a review by a group from the UCL Centre for Advanced Biomedical Imaging team (London, UK), emerging and established magnetic particle-based techniques for targeting, imaging and stimulating cells in vivo are discussed, in addition to potential benefits of their application in cell-based regenerative medicine therapies the clinic. This segment is an update on activation of innate immunity, which has had a great amount of basic science resurgence in the last several decades. It also addresses the issue of antibiotic resistance, which shall be covered more fully in later segments. Antimicrobial resistance is a growing threat, and a challenge to the pharmaceutical industry. Moreover, worldwide travel increases the possibility of transfer of strains of virus and microbiota to distant communities. 8-OH-dG: A novel immune activator. Innate immunity against viral or pathogenic infection involves sensing of non-self-molecules, otherwise known at pathogen-associated molecular patterns (PAMPs). This same sensing mechanism can be applied to damaged self-molecules, which are called damage-associated molecular patterns (DAMPs). One type of molecular pattern, for both groups, is cytosolic or extracellular DNA. However, there is not an extensive amount of research showing specifically what type of DAMP DNA molecule is best at activating this immune sensing response. A recent study investigated the mechanism behind how oxidized DNA from UV damage activates an immune sensing response. A group of researchers found that, compared to a variety of types of cellular damage, damage from UV irradiation created a strong immune response (type I IFN response), seen across different types of immune regulatory cells. This was compared with freeze/thaw, physical damage and nutritional deprivation, each of which did not produce a noticeable immune response. Additionally, this immune response was seen when DNA was exposed to UV-A and UV-B (the type of radiation produced by our sun) and UV-C radiation. DNA can be damaged by UV light directly, or through reactive oxygen species (ROS) caused by UV light. A well-known mark of DNA damaged by ROS is the oxidation of guanine to create 8-hydroxyguanine (8-OH-dG). These researchers saw an increase in 8-OH-dG dependant on the level of UV dose, and this also correlated with an increase in immune response; showing that DNA damage created by UV light in the form of 8-OH-dG is sufficient to activate an immune response. This study shows that 8-OH-dG can be classified at a DAMP. Next, this group wanted to place a mechanism to these observations. They found that the ability of oxidation-damaged DNA to activate an immune response was dependant on cGAS and STING. Free DNA in the cytosol binds cGAS, a cGAMP synthase. This action produces a messenger molecule which proceeds to bind to and activate STING, an endoplasmic reticulum protein. STING activation will ultimately stimulate a type I IFN response. When a cell’s own DNA is damaged, the cell’s machinery does all it can to repair it. This sometimes involves erasing, or degrading, the DNA that has been damaged. The enzyme, TREX1 exonuclease, has this job in a cell. However, this group found that when DNA was modified with an 8-OH-dG, it was resistant to this degradation by TREX1. This implies that the observed increase in immune response due to the presence of 8-OH-dG occurred because of an accumulation of damaged DNA, because it was not being degraded by TREX1 and could therefore sufficiently activate cGAS and STING. This type of study has important implications for autoimmune diseases like lupus erythematosus (LE), which is characterized by its abnormally high number of autoantibodies against DNA. It is possible that this uncontrollable immune response is activated by oxidation-damaged DNA. Studies in this area, therefore, hold great importance. Immune sensing of DNA is critical for antiviral immunity but can also trigger autoimmune diseases such as lupus erythematosus (LE). Here we have provided evidence for the involvement of a damage-associated DNA modification in the detection of cytosolic DNA. 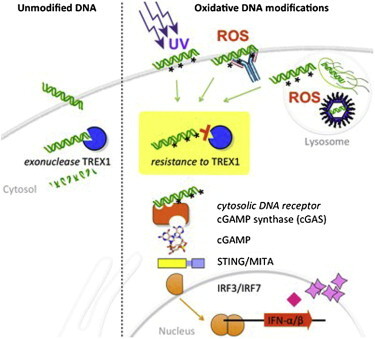 The oxidized base 8-hydroxyguanosine (8-OHG), a marker of oxidative damage in DNA, potentiated cytosolic immune recognition by decreasing its susceptibility to 3′ repair exonuclease 1 (TREX1)-mediated degradation. Oxidizative modifications arose physiologically in pathogen DNA during lysosomal reactive oxygen species (ROS) exposure, as well as in neutrophil extracellular trap (NET) DNA during the oxidative burst. 8-OHG was also abundant in UV-exposed skin lesions of LE patients and colocalized with type I interferon (IFN). Injection of oxidized DNA in the skin of lupus-prone mice induced lesions that closely matched respective lesions in patients. Thus, oxidized DNA represents a prototypic damage-associated molecular pattern (DAMP) with important implications for infection, sterile inflammation, and autoimmunity. Some harmful bacteria are increasingly resistant to treatment with antibiotics. A discovery might be able to help the antibiotics treat the disease. A soil sample from a national park in eastern Canada has produced a compound that appears to reverse antibiotic resistance in dangerous bacteria. Scientists at McMaster University in Ontario discovered that the compound almost instantly turned off a gene in several harmful bacteria that makes them highly resistant to treatment with a class of antibiotics used to fight so-called superbug infections. The compound, called aspergillomarasmine A, or AMA, was extracted from a common fungus found in soil and mold. Antibiotic resistance is a growing public-health threat. Common germs such asEscherichia coli, or E. coli, are becoming harder to treat because they increasingly don’t respond to antibiotics. Some two million people in the U.S. are infected each year by antibiotic-resistant bacteria and 23,000 die as a result, according to the Centers for Disease Control and Prevention. The World Health Organization has called antibiotic resistance a threat to global public health. The Canadian team was able to disarm a gene—New Delhi Metallo-beta-Lactamase-1, or NDM-1—that has become “public enemy No. 1” since its discovery in 2009, says Gerard Wright, director of McMaster’s Michael G. DeGroote Institute for Infectious Disease Research and lead researcher on the study. The report appears on the cover of this week’s issue of the journal Nature. “Discovery of a fungus capable of rendering these multidrug-resistant organisms incapable of further infection is huge,” says Irena Kenneley, a microbiologist and infectious disease specialist at Frances Payne Bolton School of Nursing at Cleveland’s Case Western Reserve University. “The availability of more treatment options will ultimately save many more lives,” says Dr. Kenneley, who wasn’t involved in the McMaster research. The McMaster team plans further experiments to determine the safety and effective dosage of AMA. It could take as long as a decade to complete clinical trials on people with superbug infections, Dr. Wright says. 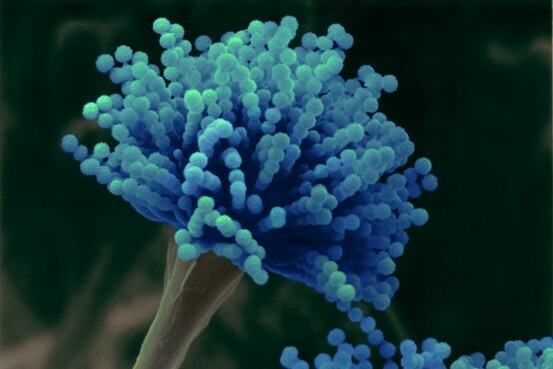 The researchers found that AMA, extracted from a strain of Aspergillus versicolor and combined with a carbapenem antibiotic, inactivated the NDM-1 gene in three drug-resistant superbugs—Enterobacteriaceae, a group of bacteria that includes E. coli;Acenitobacter, which can cause pneumonia and blood infections; and Pseudomonas, which often infect patients in hospitals and nursing homes. The NDM-1 gene encodes an enzyme that helps bacteria become resistant to antibiotics and that requires zinc to survive. AMA works by removing zinc from the enzyme, freeing the antibiotic to do its job, Dr. Wright says. Although AMA was only tested on carbapenem-resistant bacteria, he expects the compound would have a similar effect when combined with other antibiotics. AMA was first identified in the 1960s in connection with leaf wilt in plants and later investigated as a potential drug for treating high blood pressure. The compound turned up in Dr. Wright’s lab a few years ago during a random screening of organisms derived from 10,000 soil samples stored at McMaster. The sample that produced AMA was collected by one of Dr. Wright’s graduate students during a visit to a Nova Scotia park. It was the only sample of 500 tested that inhibited NDM-1 in cell cultures. The McMaster team developed a purified form of AMA for experiments on mice injected with a lethal form of drug-resistant pneumonia. Treatment with either AMA or a carbapenem antibiotic alone proved ineffective. But combining the substances resulted in more than 95% of the mice still being alive after five days. The combination was also tested on 229 cell cultures from human patients infected with resistant superbugs. The treatment resensitized 88% of the samples to carbapenem. Scripps Research Professor Wolfram Ruf and colleagues have identified a key connection between the signaling pathways and the immune system spiraling out of control involving the coagulation system and vascular endothelium that, if disrupted may be a target for sepsis. (Science Daily, Feb 29, 2008). It may be caused by a bacterial infection that enters the bloodstream, but we now recognize the same cascade not triggered by bacterial invasion. These invading bacteria produce endotoxins and other toxins that trigger a widespread inflammatory response of the innate immune system–a response that is necessary, as it turns out, because without the inflammation, the body cannot fight off the bacterial infection. During sepsis, the inflammation triggers widespread coagulation in the bloodstream. This coagulation can block blood vessels in vital organs, starving the organs of oxygen and damaging them. The organs can be further damaged when the blood starts to flow again because the lining of the blood vessels remain leaky due to inflammatory cytokines and damage by intravascular coagulation. What is the Pathogenesis of Sepsis? The acute respiratory distress syndrome (ARDS) has been defined as a severe form of acute lung injury featuring pulmonary inflammation and increased capillary leak. ARDS is associated with a high mortality rate and accounts for 100,000 deaths annually in the United States. ARDS may arise in a number of clinical situations, especially in patients with sepsis. A well-described pathophysiological model of ARDS is one form of the acute lung inflammation mediated by neutrophils, cytokines, and oxidant stress. Neutrophils are major effect cells at the frontier of innate immune responses, and they play a critical role in host defense against invading microorganisms. The tissue injury appears to be related to proteases and toxic reactive oxygen radicals released from activated neutrophils. In addition, neutrophils can produce cytokines and chemokines that enhance the acute inflammatory response. Neutrophil accumulation in the lung plays a pivotal role in the pathogenesis of acute lung injury during sepsis. Directed movement of neutrophils is mediated by a group of chemoattractants, especially CXC chemokines. Local lung production of CXC chemokines is intensified during experimental sepsis induced by cecal ligation and puncture (CLP). Under these conditions of stimulation, activation of MAPKs (p38, p42/p44) occurs in sham neutrophils but not in CLP neutrophils, while under the same conditions phosphorylation of p38 and p42/p44 occurs in both sham and CLP alveolar macrophages. These data indicate that, under septic conditions, there is impaired signaling in neutrophils and enhanced signaling in alveolar macrophages, resulting in CXC chemokine production, and C5a appears to play a pivotal role in this process. As a result, CXC chemokines increase in lung, setting the stage for neutrophil accumulation in lung during sepsis. Uncontrolled activation of the coagulation cascade following lung injury contributes to the development of lung inflammation and fibrosis in acute lung injury/acute respiratory distress syndrome (ALI/ARDS) and fibrotic lung disease. This article reviews our current understanding of the mechanisms leading to the activation of the coagulation cascade in response to lung injury and the evidence that excessive procoagulant activity is of pathophysiological significance in these disease settings. This is consistent with a pneumonia or lung injury preceding sepsis. On the other hand, it is not surprising that abdominal, cardiac bypass, and post cardiac revascularization may also lead to events resembling sepsis and/or cardiovascular collapse. The tissue factor-dependent extrinsic pathway is the predominant mechanism by which the coagulation cascade is locally activated in the lungs of patients with ALI/ARDS and pulmonary fibrosis. The cellular effects mediated via activation of proteinase-activated receptors (PARs) may be of particular importance in influencing inflammatory and fibroproliferative responses in experimental models involving direct injury to the lung. In this regard, studies in PAR1 knockout mice have shown that this receptor plays a major role in orchestrating the interplay between coagulation, inflammation and lung fibrosis. The activation of the coagulation cascade is one of the earliest events initiated following tissue injury. The prime function of this complex and highly regulated proteolytic system is to generate insoluble, crosslinked fibrin strands, which bind and stabilize weak platelet hemostatic plugs, formed at sites of tissue injury. The formation of this provisional clot is critically dependent on the action of thrombin, and is generated following the stepwise activation of coagulation proteinases via the extrinsic and intrinsic systems. Under normal circumstances, blood is not exposed to tissue factor (TF). However, upon tissue injury, exposure of plasma to TF expressed on non-vascular cells or on activated endothelial cells results in the formation of the TF-activated factor VII (FVIIa) complex. The TF–FVIIa complex subsequently catalyses the initial activation of FX to activated factor X (FXa) and FIX to activated factor IX. FXa in association with activated factor V catalyses the conversion of prothrombin to thrombin. Sustained coagulation is achieved when thrombin synthesized through the initial TF–FVIIa–FXa complex catalyses the activation of FXI, FIX, FVIII and FX. In this manner, the intrinsic pathway is activated. The systemic inflammatory response syndrome (SIRS) is the massive inflammatory reaction resulting from systemic mediator release that may lead to multiple organ dysfunction. I introduce an analysis of the roles of cytokines, cytokine production, and the relationship of cytokine production to the development of SIRS. The article postulates a three-stage development of SIRS, in which stage 1 is a local production of cytokines in response to an injury or infection. Stage 2 is the protective release of a small amount of cytokines into the body’s circulation. Stage 3 is the massive systemic reaction where cytokines turn destructive by compromising the integrity of the capillary walls and flooding end organs. While cytokines are generally viewed as a destructive development in the patient that generally leads to multiple organ dysfunction, cytokines also protect the body when localized. It will be necessary to study the positive effects of cytokines while also studying their role in causing SIRS. It will also be important to investigate the relationship between cytokines and their blockers in SIRS. Monocyte/macrophage- and neutrophil-mediated inflammatory responses can be stimulated through a variety of receptors, including G protein-linked 7-transmembrane receptors (e.g., FPR1; MIM 136537), Fc receptors (see MIM 146790), CD14 (MIM 158120) and Toll-like receptors (e.g., TLR4; MIM 603030), and cytokine receptors (e.g., IFNGR1; MIM 107470). Engagement of these receptors can also prime myeloid cells to respond to other stimuli. Myeloid cells express receptors belonging to the Ig superfamily, such as TREM1, or to the C-type lectin superfamily. Depending on their transmembrane and cytoplasmic sequence structure, these receptors have either activating (e.g., KIR2DS1; MIM 604952) or inhibitory functions (e.g., KIR2DL1; MIM 604936). [supplied by OMIM]. TREM-1 associates with and signals via the adapter protein 12DAP12/12TYROBP, which contains an ITAM. To mediate activation, TREM-1 associates with the transmembrane adapter molecule 12DAP12. In sharp contrast to the effect by Ad-FDAP12, transgene expression in the liver of soluble form of extracellular domain of TREM-1 as an antagonist of 12DAP12 signaling, remarkably inhibited zymosan A-induced granuloma formation at every time point examined. For signal transduction, 01TREM-1 couples to the ITAM-containing adapter DNAX activation protein of 12 kDa (23DAP12 ). MARV and EBOV activate TREM-1 on human neutrophils, resulting in 12DAP12 phosphorylation, TREM-1 shedding, mobilization of intracellular calcium, secretion of proinflammatory cytokines, and phenotypic changes. TREM-1 is the best-characterized member of a growing family of 12DAP12-associated receptors that regulate the function of myeloid cells in innate and adaptive responses. TREM-1 (triggering receptor expressed on myeloid cells), a recently discovered receptor of the immunoglobulin superfamily, activates neutrophils and monocytes/macrophages by signaling through the adapter protein 12DAP12. 522Granulocyte TREM-1 expression was high at baseline and immediately down-regulated upon LPS exposure along with an increase in soluble TREM-1. DIC is primarily a laboratory diagnosis, based on the combination of elevated fibrin-related markers (FRM), with decreased procoagulant factors and platelets. Non-overt DIC is observed in most patients with sepsis, whereas overt DIC is less frequent. Consumption coagulopathy is a bleeding disorder caused by low levels of platelets and procoagulant factors associated with massive coagulation activation. Treatment with drotrecogin alfa (activated) improves survival and other outcome parameters in severe sepsis, including a subgroup of patients fulfilling the laboratory criteria of overt DIC. No randomized trials demonstrating effective therapies in consumption coagulopathy have been published. Sepsis is a complex syndrome characterized by simultaneous activation of inflammation and coagulation manifested as systemic inflammatory response syndrome (SIRS)/sepsis symptoms through release of proinflammatory cytokines, procoagulants, and adhesion molecules from immune cells and/or damaged endothelium. Conventional treatments have focused on source control, antimicrobials, vasopressors, and fluid resuscitation; however, a new treatment paradigm exists: that of treating the host response to infection with adjunct therapies including early goal-directed therapy, drotrecogin alfa (activated), and immunonutrition. The drotrecogin alfa (activated) has been shown to reduce mortality in the severely septic patient when combined with traditional treatment. Therapies targeting improved oxygen and blood flow and reduction of apoptosis and free radicals are under investigation. Ultimately, intervention timing may be the most important factor in reducing severe sepsis mortality. Recent data have shown stable patterns of activation among peripheral blood mononuclear cells and neutrophils in healthy human subjects. Although polymorphisms in Toll-like receptors play a contributory role in determining cellular activation, other factors are involved as well. In addition, circulating and locally released mediators of inflammation, including cytokines, complement fragments, and components of activated coagulation and fibrinolytic systems, that are generated in increased amounts during severe infection also interact with membrane-based receptors, leading to activation of intracellular path ways capable of further accelerating proinflammatory cascades. Circulating and organ-specific cell populations are activated to produce proinflammatory mediators during sepsis. Neutrophils and PBMCs bear TLR2 and TLR4, as well as other receptors, such as protein —coupled receptor, that induce increased generation of cytokines and other immunoregulatory proteins, as well as enhance release of proinflammatory mediators, including reactive oxygen species. The expression of cytokines such as TNF-α and IL-1β is increased in sepsis, and engagement of TNF-α with type I(p55) and type II(p75) TNF receptors or IL-1β with IL-1 receptors belonging to the TLR/IL-1 receptor family produces activation of kinases (including Src, p38, extracellular signal—regulated kinase, and phosphoinositide 3–kinase) and transcriptional factors (such as nuclear factor [NF]–κB) important for further up-regulation of inflammatory proteins. Genetic polymorphisms lead to alterations in TLR conformation (a small percentage of the variability in humans when their cells are exposed to bacterial products) that are accompanied by decreased cellular activation after exposure to bacterial products. The stable variability in cellular activation that is present among the genetically heterogeneous human population, only a limited number of studies have examined how such patterns may correlate with clinical outcome. A number of studies have examined the transcriptional factor NF-κB and kinases, including p38 and Akt, and provide insights into how heterogeneity in cell signaling may contribute to subsequent clinical course. Increased activation of the mitogen-activated protein kinase protein 38, Akt, and nuclear factor (NF)–κB in neutrophils and other cell populations obtained at early time points in the clinical course of sepsis-induced acute lung injury or after accidental trauma is associated with a more-severe clinical course, suggesting that a proinflammatory cellular phenotype contributes to organ system dysfunction in such settings. Identification of patients with cellular phenotypes characterized by increased activation of NF-κB, Akt, and protein 38, as well as discrete patterns of gene activation, may permit identification of patients with sepsis who are likely to have a worse clinical outcome, thereby permitting early institution of therapies that modulate deleterious signaling pathways before organ system dysfunction develops, reducing morbidity and improving survival. The transcriptional regulatory factor NF-κB is a central participant in modulating the expression of many immuno regulatory mediators involved in the acute inflammatory response [30–35]. NF-κB/rel transcription factors function as dimers held latently in the cytoplasm of cells by inhibitory IκB proteins. 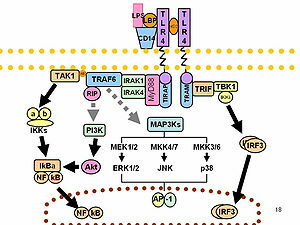 Signaling pathways initiated by engagement of TLRs, such as TLR 2 and TLR 4, by microbial products and other inflammatory mediators lead to nuclear accumulation of NF-κB and enhanced transcription of genes responsible for the expression of cytokines, chemokines, adhesion molecules, and other mediators of the inflammatory response associated with infection. Association of NF-κB with the inhibitory protein κB-α in the cytoplasm blocks the nuclear localization sequence of NF-κB, inhibiting its movement into the nucleus. Phosphorylation events, in addition to those involving IKKα/β and IκB-α, and involving NF-κB subunits (such as p 65) and nuclear coactivator proteins (such as TATA box binding protein or cAMP-responsive element—binding protein) are mediated by p 38, Akt, and other kinases and play an important role in regulating the transcriptional activity of NF-κB. Studies have shown that greater nuclear accumulation of NF-κB is accompanied by higher mortality and worse clinical course in patients with sepsis. These clinical series demonstrated that persistent activation of NF-κB was found in nonsurvivors, with surviving patients having lower nuclear concentrations of NF-κB at early time points in their septic course than did nonsurvivors as well as more rapid return of nuclear accumulation of NF-κB. Although studies of patients with sepsis have generally shown that nuclear concentrations of NF-κB are higher in non survivors than in survivors, an unresolved issue is whether such changes occur early and, therefore, define the subsequent course of sepsis or whether pathophysiological changes that result in poor clinical outcome also produce NF-κB activation as a secondary event, so that such changes in NF-κB are simply associated with more severe organ system dysfunction but do not contribute directly to outcome. A study of surgical patients without sepsis supports the hypothesis that neutrophil phenotypes defined by NF-κB activation patterns predict clinical outcome . In that clinical series of patients undergoing repair of aortic aneurysms, higher preoperative levels of NF-κB in peripheral neutrophils were associated with death and with the development of postoperative organ dysfunction. Stable high and low responder phenotypes in the healthy population, implies that the presence of a preexistent high responder neutrophil phenotype, as characterized by increased nuclear translocation of NF-κB after stimulation with TLR 2 or TLR 4 ligands, would be associated with more severe pulmonary inflammatory response and clinical course in response to infection. Conversely, persons whose neutrophils have diminished activation of NF-κB after stimulation would be expected to have less-intense neutrophil-driven inflammation, as well as organ dysfunction. In addition, Nuclear levels of nuclear factor (NF)–κB are significantly increased in neutrophils obtained within 24h of initiation of mechanical ventilation in patients whose clinical course from sepsis-induced acute lung injury is more severe (as defined by death or ventilation for >14 days—that is, ⩽14 ventilator-free days [VFD]), compared with patients with a less-severe course (as defined by mechanical ventilation for <14 days, or >14 VFD). Baseline nuclear concentrations of NF-κB were lower in healthy volunteers than in patients with sepsis-induced acute lung injury, regardless of subsequent clinical course, demonstrating baseline activation of NF-κB in association with sepsis. *P <.05, vs. volunteers. †P< .05, vs. >14VFD. Modulation of intracellular signaling cascades involving kinases, such as p 38 or Akt, or transcriptional factors, such as NF-κB, through specific inhibitory approaches has shown their pathophysiological importance in experimental models. However, the role of specific intra cellular pathways in contributing to clinical outcomes in patients with sepsis remains incompletely determined, primarily because such alterations in cellular activation patterns have not been examined at early time points before the onset of multiple organ dysfunction. Recent information shows that alterations in p38, Akt, and NF-κB among neutrophils and other cell populations not only precedes the development of organ system dysfunction but also has predictive value in identifying patients with a more severe subsequent clinical course. RC Chambers. Procoagulant signalling mechanisms in lung inflammation and fibrosis: novel opportunities for pharmacological intervention? British Journal of Pharmacology 2008; 153, S367–S378; doi:10.1038/sj.bjp.0707603. RC Bone. Toward a theory regarding the pathogenesis of the systemic inflammatory response syndrome: What we do and do not know about cytokine regulation. Crit Care Med 1996; 24:163-172. Bouchon A, Facchetti F, Weigand MA, Colonna M. TREM-1 amplifies inflammation and is a crucial mediator of septic shock. Nature 2001; 410 (6832): 1103-7. doi:/10.1038/35074114. PMID 11323674. Bleharski JR, Kiessler V, Buonsanti C, et al. A role for triggering receptor expressed on myeloid cells-1 in host defense during the early-induced and adaptive phases of the immune response. J. Immunol. 2003; 170 (7): 3812-8. PMID 12646648. Colonna M, Facchetti F. TREM-1 (triggering receptor expressed on myeloid cells): a new player in acute inflammatory responses. J. Infect. Dis 2003; 187 (Suppl 2): S397-401. PMID 12792857. Dempfle CE. Coagulopathy of Sepsis. Thromb Hemost 2004; 91:213-224. Cunneen J, Cartwright M. The Puzzle of Sepsis: Fitting the Pieces of the Inflammatory Response with Treatment. AACN Clin Issues 2004;15:18-44. Ren-Feng Guo, NC Riedemann, Lei Sun, Hongwei Gao, KX Shi, et al. Divergent Signaling Pathways in Phagocytic Cells during Sepsis. The Journal of Immunology, 2006, 177: 1306–1313. Yang KY, Arcaroli JJ, Abraham E. Early alterations in neutrophil activation are associated with outcome in acute lung injury. Am J Respir Crit Care Med 2003; 167:1567-74. Abraham E. Neutrophils and Acute Lung Injury. Crit Care Med 2003; 31:195-9. Abraham E, Carmody A, Shenkar R, Arcaroli J. Neutrophils as early immunologic effectors in hemorrhage- or endotoxemia-induced acute lung injury. Am J Physiol Lung Cell Mol Physiol 2000; 279:1137-45. How is the disease recognized? Of 289 patients with bacteremia, 52% had normal WBC count and 17% had neither WBC elevation nor fever. Despite multiple studies showing that a normal white blood cell (WBC) count does not exclude serious disease, physicians in all specialties continue to behave as if it did. Among 289 patients (8%) with positive blood cultures, 77% had fever and 48% had elevated WBC count on initial measurement. Neither fever nor an elevated WBC count was noted in 17% of bacteremic patients. The WBC count is not an adequate discriminatory test for bacteremia. The term SIRS has been widely adopted by clinicians and investigators. As SIRS criteria are not specific for sepsis, several studies have evaluated the usefulness of SIRS criteria for the diagnosis of sepsis. A subanalysis of the Sepsis Occurrence In Acutely Ill Patients (SOAP) study based on intensive care unit (ICU) patients, showed that critically ill patients often fulfill the criteria for SIRS, regardless of whether they are infected or not. At ICU admission, 87% of patients had at least two SIRS criteria, most commonly respiratory rate (84%) or heart rate (71%). There was, however, a higher frequency of three or four SIRS criteria versus two SIRS criteria in infected than in noninfected patients. Interestingly, all infected patients had at least two SIRS criteria. Thus, although the SIRS criteria are so sensitive and are present in so many ICU patients that their value in identifying infected patients is limited, patients fulfilling two or more SIRS criteria should be closely evaluated for infection. The mortality attributable to infection seems to be similar in patients with sepsis and in those without. The physiologic variables associated with SIRS and sepsis are not only important for the diagnosis and prognosis but also for guiding the treatment. In 1997, the ACCP/SCCM consensus group created a set of practice parameters for the hemodynamic management of patients in septic shock. According to these practice parameters, the initial priority in managing septic shock should be to maintain mean arterial pressure (MAP) by adequate hemodynamic support. In fact, treatment with either MAP or systolic blood pressure as the main therapeutic endpoint is the most commonly recommended and supported clinical monitoring practice. Maintenance of adequate MAP can help ensure adequate organ and tissue perfusion during the time required to detect and treat the infectious process causing the sepsis. the continuous monitoring of physiologic parameters for early sepsis screening continued to center on hypoperfusion and the clinical definitions of hypoperfusion were expanded to include systolic blood pressure less than90 mm Hg, MAP less than 65 mm Hg, a decrease in systolic blood pressure of more than 40 mm Hg, and a decrease in urine output. This early identification of physiologic instability expedites basic resuscitation. Nine of the 10 signs of vitality can be assessed within several minutes; the 10th [base deficit, calculated after arterial puncture, or central venous oxygen saturation (ScVO2), obtained from a central venous catheter] requires 15-minutes. SOFA score is used to predict the probability of infection in critically ill patients based on physiologic parameters like body temperature, respiratory rate, and heart rate, together with other parameters like white blood cell count, C-reactive protein, and Sequential Organ Failure Assessment (SOFA) score by using multiple regression to calculate the relative weight of each parameter in relation to the presence of infection. The significant variables were: body temperature greater than 37.5 C, heart rate greater than 140, and C-reactive protein greater than 6 mg/dL. Among the clinical variables, heart rate was the best predictor of infection, whereas respiratory rate had the poorest predictive value. However, the investigators decided to include all variables in the Infection Probability Score (IPS), assigning points according the relative weight of each parameter in relation to the presence of infection. DJ Pallin. Normal White Blood Cell Count Does Not Rule Out Bacteremia. 07/03/2012; Journal Watch. Cornbleet PJ. Clinical Utility of The Band Count. In Interpretation of The Peripheral Blood Film. CLINICS IN LABORATORY MEDICINE 2002; 22(1): 101-111. Seigel TA et al. Inadequacy of temperature and white blood cell count in predicting bacteremia in patients with suspected infection. J Emerg Med 2012 Mar; 42:254. A biomarker has been defined as “a characteristic that is objectively measured and evaluated as an indicator of normal biologic processes, pathogenic processes, or pharmacologic responses to therapeutic intervention. The theoretic advantage of combining several biomarkers into a single classification rule is that it should help to improve their classification accuracy and, therefore, their clinical usefulness. when several markers are measured, they are often considered separately, irrespective of the additional information contained in their joint interpretation. This does not constitute a multimarker panel. This distinction is important, because these studies typically describe a list of different biomarkers with potential diagnostic or prognostic values that are used as individual predictors of disease or clinical outcome. Another common confusion is the term multiplex assay, which is a type of laboratory procedure that simultaneously measures multiple analytes (dozens or more) in a single assay. It is distinguished from procedures that measure 1 or a few analytes at a time.9 In contrast, a multimarker panel involves each biomarker representing the inputs to a multivariable, computational prediction or classification model. The Institute for Healthcare Improvement (IHI) has highlighted sepsis as an area of focus and has identified several deficiencies that may cause suboptimal care of patients with severe sepsis. These deficiencies include inconsistency in the early diagnosis of severe sepsis and septic shock, frequent inadequate volume resuscitation without defined endpoints, late or inadequate use of antibiotics, frequent failure to support the cardiac output when depressed, frequent failure to control hyperglycemia adequately, frequent failure to use low tidal volumes and pressures in acute lung injury, and frequent failure to treat adrenal inadequacy in refractory shock. To address these deficiencies, the Surviving Sepsis Campaign and IHI have revised and added to the Surviving Sepsis Guidelines and created 2 sepsis treatment bundles (resuscitation and management) to guide therapy for patients with severe sepsis. “Implicit in the use of the bundles is the need to adopt all the elements contained in the bundle,” the authors write. “One cannot choose to apply only selected items from the bundle and expect to achieve comparable benefit. The IHI sepsis website provides tools to screen patients for severe sepsis, as well as to measure success with adherence to implementing the bundles (http://www.ihi.org/IHI/Topics/CriticalCare/Sepsis/).” (The authors are employees of Eli Lilly and Co, the maker of drotrecogin alfa (activated). South Med J. 2007;100:594-600. Discharge prealbumin and the change in prealbumin were positively correlated with protein and energy intake and inversely correlated with markers of inflammation, particularly CRP and IL-6. When all covariates were included in a multivariable regression analysis, the markers of inflammation predominantly accounted for the variance in prealbumin change (56%), whereas discharge protein intake accounted for 6%. These authors propose an updated approach that incorporates current understanding of the systemic inflammatory response to help guide assessment, diagnosis, and treatment. An appreciation of a continuum of inflammatory response in relation to malnutrition syndromes is described. This discussion serves to highlight a research agenda to address deficiencies in diagnostics, biomarkers, and therapeutics of inflammation in relation to malnutrition. The most frequent indication for antibiotic prescriptions in the northwestern hemisphere is lower respiratory tract infections (LRTIs),which range in severity from self-limited acute bronchitis to severe acute exacerbation of chronic obstructive pulmonary disease (COPD), and to life-threatening bacterial community-acquired pneumonia (CAP).4 Clinical signs and symptoms, as well as commonly used laboratory markers, are unreliable in distinguishing viral from bacterial LRTI. As many as 75% of patients with LRTI are treated with antibiotics, despitethe predominantly viral origin of their infection. An approach to estimate the probability of bacterial origin in LRTI is the measurement of serum procalcitonin (PCT). Despite improvements in the treatment of sepsis in recent years, there have been few diagnostic innovations which improve the sensitivity and specificity of diagnosis or facilitate therapeutic monitoring. The clinical reliance on the CBC and leukocyte differential with associated band count to indicate myeloid left shift of immaturity is not accurate, and it is not comparable to the measurement of the metamyeloctes and myelocytes. Only the introduction of a test which measures procalcitonin (PCT), an acute phase marker which is claimed to be more specific for bacterial infections than for viral infections, can be cited as a new diagnostic for the evaluation of patients with suspected infection. A need still persists for improved diagnostic indictors of infection or sepsis, as well as better tests to facilitate monitoring of therapy in the treatment of infection, so that use of antibiotics might be less empirical. Studies have indicated that quantitative neutrophil CD64 expression is a sensitive and specific laboratory indicator of sepsis or the presence of a systemic acute inflammatory response. Neutrophil CD64 is a highly sensitive marker for neonatal sepsis. Prospective studies incorporating CD64 into a sepsis scoring system are warranted. Studies have indicated that quantitative neutrophil CD64 (high affinity Fc receptor) expression is a worth­while candidate for evaluation as a more sensitive and specific laboratory indi­cator of sepsis or the presence of a systemic acute inflammatory response than available diagnostics . Neutrophil (PMN) CD64 is one of many activa­tion-related antigenic changes manifested by neutrophils during the normal pathophysiological acute inflammatory or innate immune response. PMN expression of CD64 is up-regulated under the influence of inflammatory relat­ed cytokines such as interleukin 12 (IL-12), interferon gamma (IFN-y) and granulocyte colony stimulating factor (G-CSF). The first commercially available assay for PMN CD64, developed by Trillium Diagnostics, LLC is a fluorescence based, no wash flow cytometric assay, namely the Leuko64. The assay kit contains a cocktail of monoclonal antibodies includ­ing two monoclonal antibodies to CD64 and a monoclonal antibody to CD163, red cell lysis buffer, fluorescence quantitation beads, and a software program for automated analysis of the flow cytometric data that reports PMN CD64 as a CD64 index. The PMN CD64 index is designed so that normal inactivated PMNs yield values of < 1.00 and blood samples from individuals with docu­mented infection or sepsis typically show values > 1.50. Using clinical flow cytometers, the assay can be completed within 30 minutes. While this initial assay format was developed for multiparameter flow cytometers, a new version of the assay has been developed to give nearly identical results on the CD4000 and Sapphire (manufactured by Abbott Diagnostics, Santa Clara, CA) blood cell counters, which are equipped with laser light sources and fluorescence detection capabilities. If these blood cell counters are available in diagnostic haematology laboratories, the Leuko64 assay can be utilised on a 24 hour basis, in contrast to the more typical daytime operation hours of flow cytometric diagnostic laboratories. Leukocare and Trillium Diagnostics entered an agreement to develop and market Leukocare’s method for detecting inflammatory activity using circulating cell-free DNA. Trillium aims to create a cf-DNA test as a “simple and cost effective” tool that healthcare professionals can use to obtain clinically relevant data on patients who are suspected of having sepsis. The companies said that they expect to finish developing the assay and market it in two years. Jensen GL, Bistrian B, Roubenoff R, Heimburger DC. Malnutrition Syndromes: A Conundrum vs Continuum. Bernstein LH. The systemic inflammatory response syndrome C-reactive protein and transthyretin conundrum. Clinical Chemistry Laboratory Medicine 2007; 45(11):1566–1567, ISSN (Online) 14374331, ISSN (Print) 14346621, DOI: 10.1515/CCLM.2007.334. Davis BH. Neutrophil CD64 expression in infection and sepsis. CLI Ocober 2006. Leukocare, Trillium Partner on Sepsis Assay Development. Genome Web News. October 10, 2012. Though vasopressors may be appropriate to increase coronary blood flow in a hypotensive patient with malignant ventricular arrhythmias, the effect of their use on other organ function and even on patient outcome remains uncertain. While we have often strived to maintain normality in critically ill patients, such as arterial blood gases in patient with acute lung injury/acute respiratory distress syndrome, we now realize that such practice is generally incorrect and may have induced harm in the process. Anti-TNF strategies are only partially effective in patients with sepsis. Although individual studies show small, nonsignificant benefits, analysis of all trial data as well as data from a recent trial in a large population of septic patients show that anti-TNF strategies may confer a small survival benefit. Reinhart K, Karzai W. Anti-tumor necrosis factor therapy in sepsis: update on clinical trials and lessons learned. Crit Care Med. 2001; 29(7 Suppl):S121-5. Aprotinin is a serine protease inhibitor that binds to human serine proteases with various affinities. This small protein has profound effects on the systemic inflammatory response syndrome induced by cardiopulmonary bypass. The intersecting pathways of complement, cytokines, coagulation, fibrinolytic, and kinin-kallikrein systems all converge with tremendous amplification and potentially damaging effects to the patient. Following publication of the original study describing high dose aprotinin therapy in repeat coronary artery bypass graft (CABG) surgery in 1987, an extensive body of literature has accumulated supporting the efficacy of aprotinin to reduce blood loss and transfusion requirements in cardiac and orthopedic surgeries. Cardiopulmonary bypass (CPB) initiates the activation of several intersecting plasma protease pathways: the kinin-kallikrein system, the coagulation-fibrinolytic cascade, and the complement system. Activation of each of these pathways results in the production of proinflammatory mediators, resulting in a systemic inflammatory response syndrome (SIRs). Ischemia reperfusion also contributes to the SIRs through the activation of humoral and cellular pathways. Such hemostatic and inflammatory responses are well orchestrated, inter-related processes with the capacity for tremendous amplification. A great advance in treating sepsis patients came with the early completion of the activated protein C trial in June 2000. Since that time, trial results have been peer reviewed and recombinant human activated protein C has become available internationally (drotrecogin alfa [activated]). Recent controversy has arisen regarding protocol changes that occurred during the study and about reduced or absent benefit for patients of the lowest severity of illness. Jay Siegel of the US Food and Drug Administration published the indications for use the New England Journal of Medicine. The use of activated protein C, as compared with placebo, was associated with a significant reduction in mortality in the Recombinant Human Activated Protein C Worldwide Evaluation in Severe Sepsis (PROWESS) trial (24.7 percent vs. 30.8 percent, P=0.005). Extensive review by physicians and scientists at the FDA confirmed the principal findings of the PROWESS trial but raised issues regarding the interpretation of data and appropriate use of the drug. These issues were discussed with experts on sepsis from outside the FDA at a public meeting of the agency’s Anti-Infective Drugs Advisory Committee on October 16, 2001. The committee members provided valuable input; highlighted specific issues of concern, some of which are summarized in the accompanying Sounding Board by Warren et al. ; and were evenly divided in a vote on a recommendation regarding approval. The FDA then performed substantial additional evaluations addressing the issues that had been raised and concluded that activated protein C had been demonstrated to be safe and effective in reducing mortality among patients with severe sepsis and a high risk of death, as determined, for example, by the Acute Physiology and Chronic Health Evaluation (APACHE II) score. In order to increase the capacity of the trial to detect effects on mortality due to sepsis, the eligibility criteria for the activated protein C study attempted to exclude patients who were likely to die from underlying disease within 28 days. The amendments to the eligibility criteria were intended to make this exclusion more effective. Two analyses indicate that these amendments did not account for the improved study outcomes. Treatment with activated protein C was associated with a 3 percent absolute reduction in mortality among patients without chronic health points on APACHE II but with a 19 percent absolute reduction in mortality among patients who had chronic health points. The P value for the interaction of treatment effect and APACHE II chronic health points was 0.01. Both of these analyses indicate that the amendments to the protocol, rather than accounting for improved results, actually excluded patients who appeared more likely to benefit from therapy. In addition, these two analyses address the generalizability of the results of the PROWESS trial to patients with sepsis who have serious preexisting disease.3 They suggest strongly that serious preexisting disease should not, in general, be a reason for withholding activated protein C therapy. Hill GE, Pohorecki R, Alonso A, Rennard SI, Robbins RA. Aprotinin Reduces Interleukin-8 Production and Lung Neutrophil Accumulation After Cardiopulmonary Bypass. Anesth Analg 1996; 83:696-700. American College of Chest Physicians/Society of Critical Care Medicine Consensus Conference: Definitions for sepsis and organ failures and guidelines for the use of innovative therapies in sepsis. Crit Care Med 1992; 20:864-874. Bernard GR, Vincent J-L, Laterre P-F, et al. Efficacy and safety of recombinant human activated protein C for severe sepsis. N Engl J Med 2001; 344:699-709. Parillo JE. Plenary Presentation. Update on Sepsis Consensus Conference. Program and abstracts of Chest 2002: The 68th Annual Scientific Assembly of the American College of Chest Physicians; November 2-7, 2002; San Diego, California.